In collaboration with a prominent UK agency, we have taken the baton invitation to another level for the Rio Games. There were significant design challenges; firstly, how to engineer the baton so that a scroll could pull out through a slot and wind back inside smoothly. And secondly, to find a material for the scroll that was tough, flexible and sufficiently opaque to take a vivid full colour print both sides. This summer, nearly 15,000 athletes from 206 countries will compete in the Olympic and Paralympic Games in Rio de Janeiro. The brightly coloured look and feel of the Games inspired by the contagious energy and exuberant nature of the city and its people. Four years ago we were asked to create a very special invitation to London 2012. 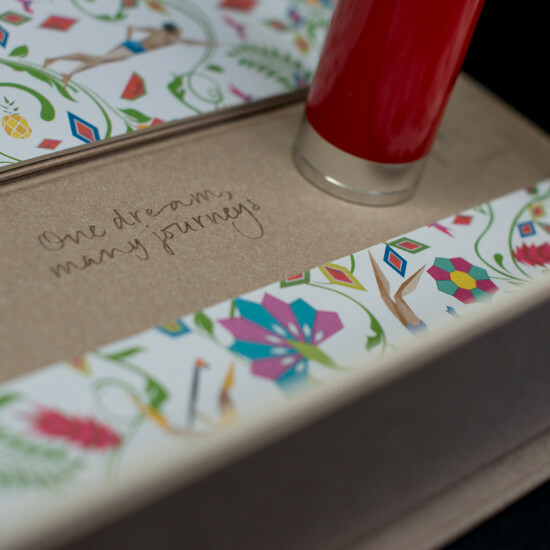 Our solution was an exquisitely designed relay baton with the invitation rolled inside. In collaboration with a prominent UK agency, we have taken the baton invitation to another level for the Rio Games. 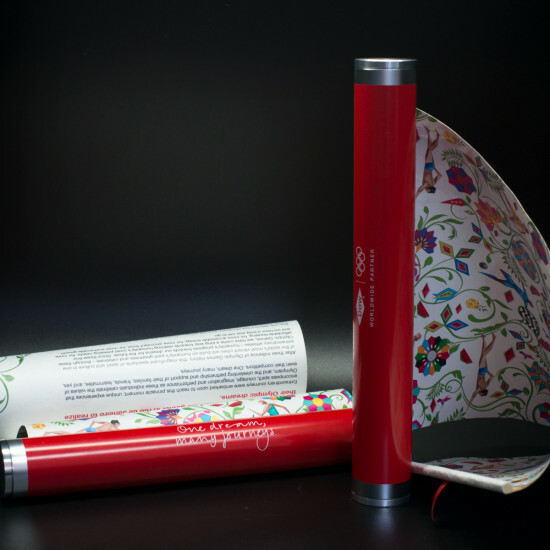 Dow, a worldwide Olympic partner, wanted to invite their top corporate clients to the Olympic Games using a relay baton, but in a new and stylish way; the message had to pull out like a traditional scroll and then retract. The scroll needed to be long enough to tell the Olympic story on one side and carry a colourful Olympic inspired print on the reverse. There were significant design challenges; firstly, how to engineer the baton so that a scroll could pull out through a slot and wind back inside smoothly. And secondly, to find a material for the scroll that was tough, flexible and sufficiently opaque to take a vivid full colour print both sides. The solution required a precision engineered mechanism robust enough to deploy the scroll without jamming or tearing. The baton invitations were a great success, delivered in beautiful full colour lined boxes.